October was an exceptionally hot month in Southern California, with numerous high temperature records falling across a broad region. Many SoCal sites set new records for their hottest temperatures for so late in the calendar year–well into the triple digits in most places, even near the coast. Most of Northern California was still quite warm, though less anomalously so. Temperatures have finally cooled in recent days back toward seasonably cool levels. Meanwhile, the rainy season has thus far gotten off to a pretty slow start across most of the state. While most of NorCal has now seen wetting rainfall (and, in some spots, “fire season-ending” accumulations), the southern part of the state has thus far been quite dry so far this autumn. Dry autumns are not necessarily that unusual in Southern California–and, as I’ve previously discussed, do not necessarily foretell a dry winter to come. Last week, it had appeared that a series of relatively moist storm systems might finally bring widespread rainfall to much of the state. Instead, these systems brought mostly light precipitation to Northern California and only drizzle across portions of SoCal. A very strong blocking ridge of high pressure has developed over the northern Gulf of Alaska in recent days, leading to a high-amplitude flow pattern over the North Pacific and inducing all kinds of unusual weather to the east. Southern California recent dryness is partially attributable to the atmospheric wave pattern induced by this “boulder in the stream” to our northwest, though weaker subtropical ridging had been the bigger player during much of October. High pressure in this region also tends to result in cold air outbreaks over the western Canadian interior, as cold Arctic air spills southward (and even southwestward) on the east side of the ridge. This strong ridge is no exception: over the weekend, a fairly remarkably early season Arctic outbreak brought rare early November snowfall to sea level in Vancouver and Seattle. Seattle usually only sees snow once or twice a year (and some years, none at all! ), making this light dusting one of the earliest on record. This unusual cold over the Pacific Northwest, though, is more than counterbalanced by extremely warm temperature anomalies over the Arctic Ocean just north of Alaska resulting from this ridge. Amazingly, sea ice has yet to form in the Chukchi and Bering Sea (and, remarkably, mostly ice-free seas are still visible in the live webcam view from Utqia?vik (Barrow)). There have been a spate of recent winters exhibiting similar high-latitude blocking patterns, with a resulting “warm Arctic” and “cold continent” pattern developing during successive weeks. There is quite a bit of ongoing research exploring these events and their potential connection to sea ice loss (along with weather extreme-related impacts further to the south). This kind of pattern is very tricky to forecast for two key reasons. First, blocking ridges have a tendency to be quite persistent–and weather models sometimes have a hard time capturing the self-reinforcing feedback loops that can develop under favorable conditions. Second, the “downstream” effects of large, persistent ridges can be highly dependent on geographic nuance–small shifts the exact position of the ridge relative to the jet stream or nearby mountain ranges, for example, can mean the difference between relentless storminess/Arctic outbreaks and multi-week sunny spells in any particular location. At our relatively low latitude in California, there is also a third option: strong Gulf of Alaska ridges can also cause the subtropical and subpolar jet streams to merge in a fashion that brings large storms to the Pacific Southwest. At the moment, it appears that the subtropical jet is just not robust enough to bring any active weather to California. Most models suggest that the Gulf of Alaska ridge is likely to persist for at least the next 10 days, and perhaps quite a bit longer than that. In fact, the weekly CFS forecasts (which were recently shown to have considerable skill on 3-4 week timescales) suggest that it could linger into December. 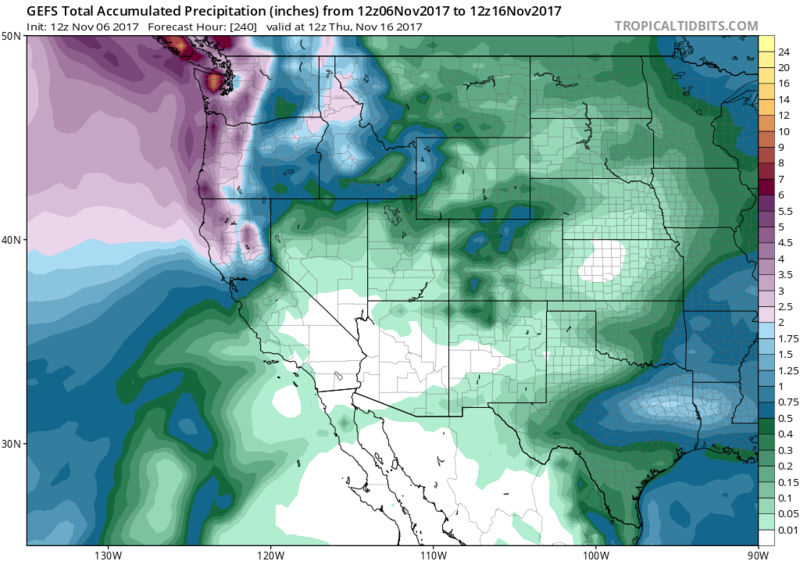 That doesn’t mean that conditions will be completely dry in California; in fact, model ensemble forecasts still bring widespread light to moderate precipitation to the northern third of California over the next couple of weeks. But Southern California is likely to remain pretty dry for the foreseeable future, and there are no big storms on the horizon in Northern California, either. La Niña conditions still appear to be developing across the eastern equatorial Pacific Ocean, which (as previously discussed) tends to tilt the odds toward a dry winter in Southern California. 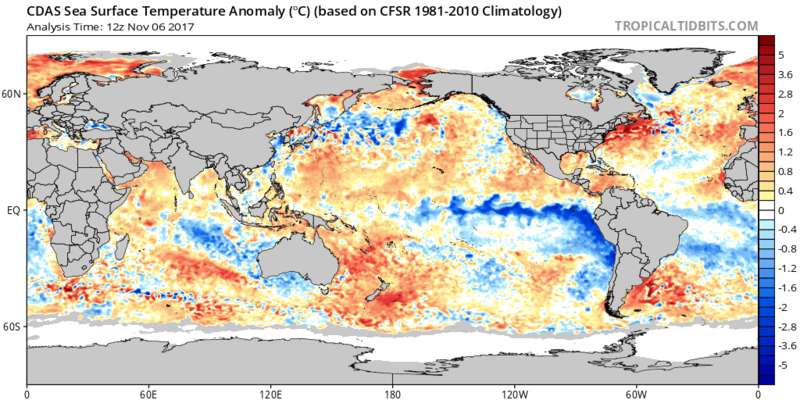 Portions of the western tropical Pacific are also anomalously warm at the moment which recent work (including some of my own, which I’ll discuss in greater detail in a future post) suggests is favorable for the occurrence of winter ridging near California. At the moment, then, there is some evidence hinting that a pattern similar to the present one may recur with some regularity this winter. As noted above: Gulf of Alaska blocking can be a double-edged sword–typically resulting in relatively dry and stable conditions over California, though occasionally allowing for cold air outbreaks and active jet stream mergers over the East Pacific. But for the next couple of weeks, at least, North Pacific ridging is likely to prevail.